Trying to find a seat belt that could fit into the bus without buying it new is pretty tough. 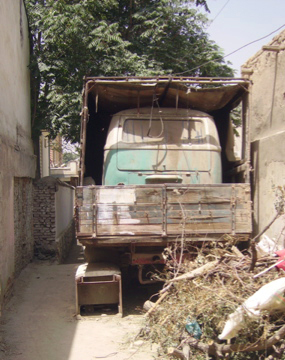 None of Kabul’s junkyards have what I’m looking for. Something vintage, let’s says between 1960 and 1970. Safety first ; it’s a long road to France. Interesting name for a mysterious place. Why did they pick this name ? It could have been more romantic ! Anyway I go there, it’s easy to find, a big four storey building on the side of one of the Kabul’s main boulevards. Covered with golden mirror, the entire building is shining and almost dazzling me. It’s one of those new buildings, really dangerous, that could turn into a threat if there is any earthquake (which happen often here) all these mirrors just collapse. Mirror buildings are unfortunately in fashion these days. The contrast between inside and outsider is pretty impressive. ground zero : body parts like headlights, mirrors, bumpers. 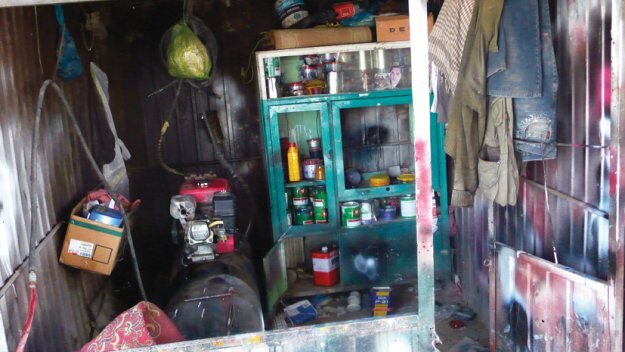 second floor : specializes in mechanisms, electric windows, door locks, dash boards components…. At the end you find out that every shop has a little bit of everything and if they don’t their brother or a cousin has it a few shops over. That means you have to spend the time to search and chat with the shopkeepers to find what you are looking for. The display in each shop is an art form very special, some use shelves to display their products, some prefers the huge mountain in the middle of the floor, some others have everything on strings. This last technique is pretty original and really interesting. I went in a shop where I literally had to enter on my knees. It was just impossible to stand up inside, too many things hanging. Like enormous grapes of headlights, wind-shield whippets… Don’t be clostrophobic, just ask what you want, the shop keeper will sneak around and grab it for you. 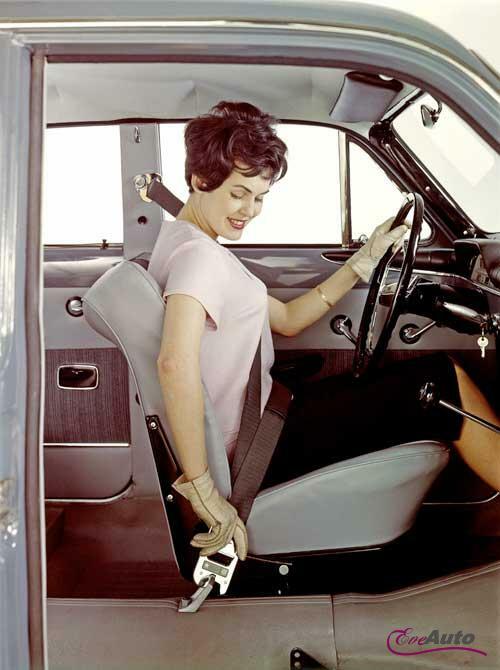 I need a seat belt that could fit my bus without looking too modern. 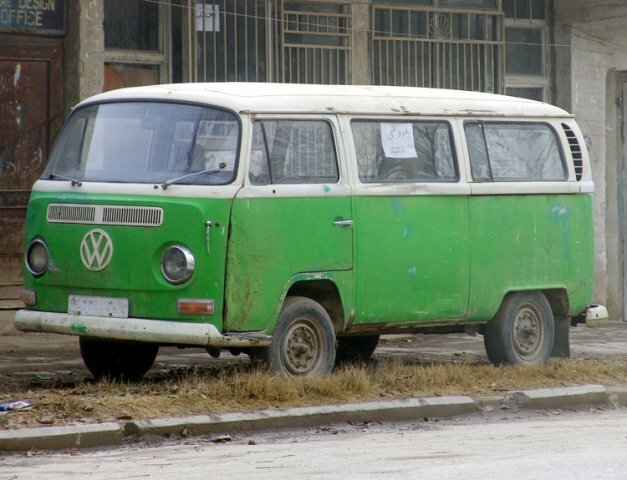 I want them to fit the style of the Kombi. So basically I have no precise model in mind nor a brand. Good luck to me to explain that in Dari to the shopkeeper. They look at me with a strange eye. Why would this foreigner need to put a seat belt in a car ! And why is he driving such a relic from the past ! That’s what I want ! What a challenge. Every one wants to sell me something so I end up looking at every kind of seat belt system : with sensors, with plastic, some broken, even some airbags ! Everything, but nothing I need. It took me two hours to find a nice pair of seat belts. I went through the entire building. I now know every shopkeeper, their relatives everything. I finally got a pair from a 1975 jeep in good condition. I will accept these and I won’t be difficult even though I’m not a big fan of the kaki color. Two cups of tea later the shopkeeper gives me all the nuts and bolts to install them. Sold. I run to Ahad’s workshop to install them on the bus. Ahad has good idea, I show him some drawings and he tells me how he thinks we should do it. So I go for it. He really does a good job. The belts are anchored in 3 points. 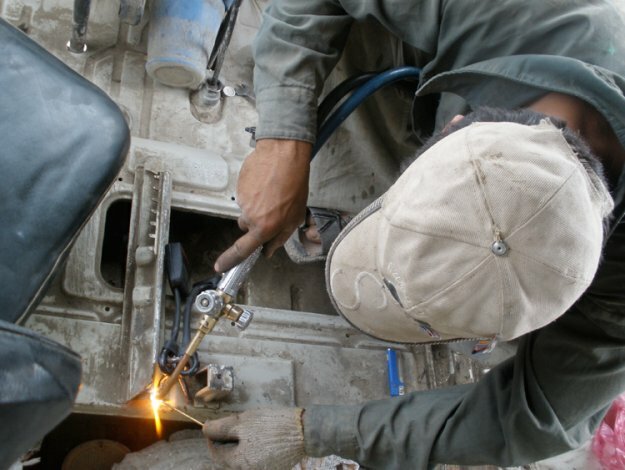 You don’t see any welding, it’s great, and they WORK !!!! There is nothing else to do on the frame, the bus is now ready for the next step. He is primed, has the seat belts and got a deep wash. Two new coats of paint and he will find his lost youth back. But there is no engine, we push the Kombi to the painters. The team is more or less ready, they’re always something to work on. I put the puzzle together. Parts are everywhere, I even find one of the seats on the neighbors’ workshop. I’m glad they enjoy its comfort. 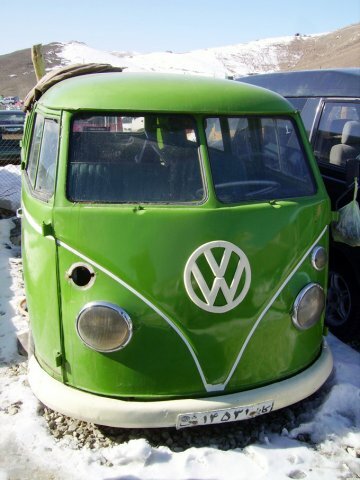 The tank, two bumpers, the VW sign, all the air forced metal parts—everything is here. The dance of the airbrush can start, turn on the compressor ! The painter’s assistant pours a big quantity of water on the floor. You have to check the weathear forecast before you start, There will be no dust. Today is a good day without wind so no dust. No cabin, just tarps on the top and in the front of the vehicle. I am really busy trying to get the title of the bus and can’t stay to see the painting process. When I come back two days later, a bit nervous, I find my bus turned into a shinny mirror. 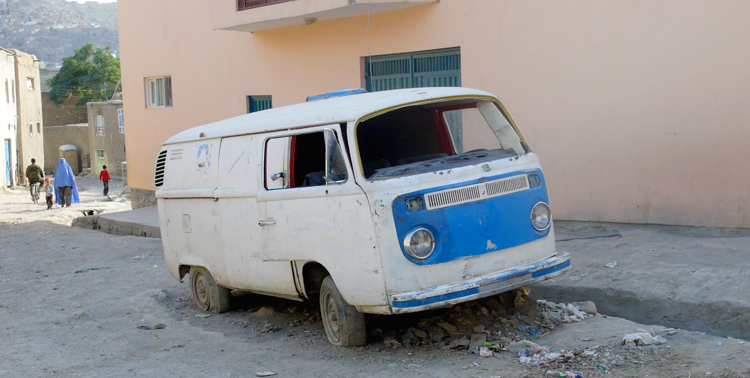 Afghan people really knows how to polish a car. Three coats, it’s almost too much. I’m not worried, after two days outside he will get a new patina. I wish I could have get a varnish on the top, but they don’t use that in Afghanistan. That’s how they keep their business busy, you come back for an other polish…. Clever. 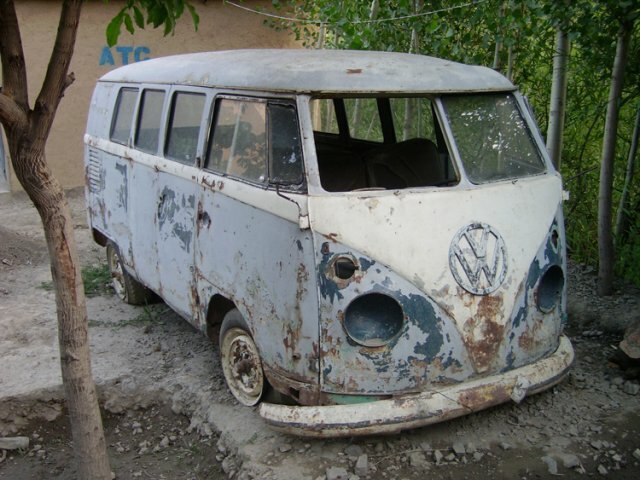 Nice job, the Kombi lost the patina he had originally, but it’s the only way to be allowed to go out of this country and especially to enter new countries. It’s tough to enter Iran with a wreck. This is a good motivating step. The next one is to put everything back together, the engine and all the windows, handles….The best is to come. Every single thing I put back in gets me closer to a finished bus. So nice to see this step by step process. But regarding the papers, we have troubles.